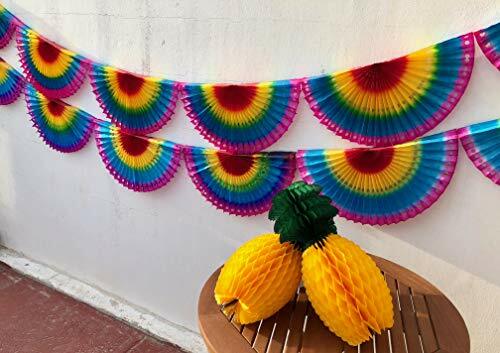 12-FAN 2 BANNER MULTI-COLOR VALUE PACK: Our Luau party supplies comes fully assembled and ready to use!!! No DIY hassle!!! PREMIUM PARTY SUPPLIES BUNDLE: Our handcrafted Fans offer you creativity and fun. A sure way to light up your party for unforgettable memories. Installation is hassle-free. Pineapples NOT Incluided. VERSATILE APPLICATIONS: Our decorative solutions are perfect for your Luau party, Moana and other events. Add great style to your celebration with our colorful party supplies kit. EASY TO USE: These tissue paper party décor kit is easy to use. Simply remove from protective cover and use as table skirt decorations, banner in your event center or home for a great decoration setup. You do not need any training or expertise to set them up. If you have any questions about this product by Fiesta Brands, contact us by completing and submitting the form below. If you are looking for a specif part number, please include it with your message.